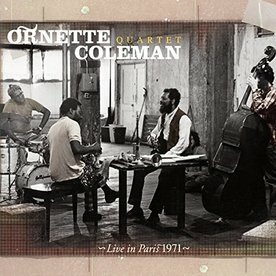 Ornette Coleman, alto saxophone, trumpet, violin; Dewey Redman, tenor saxophone, musette; Charlie Haden, bass; Ed Blackwell, drums. Original recordings live in Paris, 1971 and previously issued as a Japanese bootleg LP, Paris Concert. There are just four numbers on this CD, but it has to be said that this fabulous performance is a major showcase for the quartet and a virtual revelation of how to unravel extemporisation from the chords of the music. It is also a fascinating study in the construction of a band, as it becomes clear that Dewey Redman’s tenor is not there as second solo instrument as one might expect, but is there as Ornette’s foil. The tenor lines are woven in and out and around the alto, its annotations giving the alto greater girth and profundity, greater mass to add weight to the alto’s statements. Interesting too is Redman’s switch to musette on Rock the Clock with Coleman’s accompanying switch to trumpet and Charlie Haden’s introducing wah-wah to his bass. They switch again, trumpet forsaken for violin backed by tenor, then back again to trumpet, musette and plucked bass. The quartet’s music is effervescent, vibrant and the improvisation imaginative and articulate. This is very fine jazz indeed and the quartet ranks amongst the very top bands ever in the jazz milieu.